Signs for the Cal Neva on Stateline Road still say the casino is closed for rennovation. “Lady of the Lake” might have been the nickname Frank Sinatra gave North Lake Tahoe’s Cal Neva Lodge and Casino, but she has seen much better days. 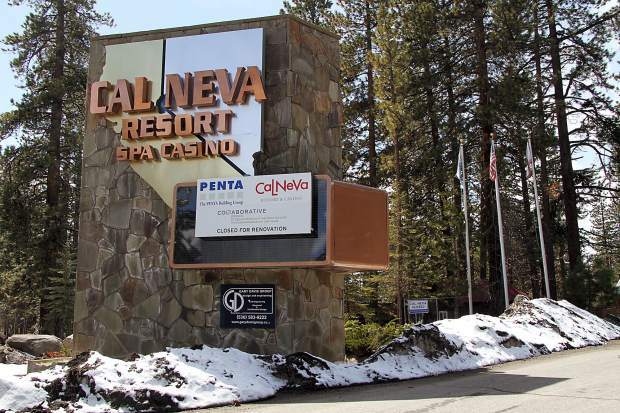 Lake Tahoe’s Cal Neva Resort boasts stunning views as well as a rich history, but remains closed ever since the property owners began renovations and filed for bankruptcy in June 2016, before the work was completed. Even with its troubled past and less-than-busy location, the aging, fenced-off Cal Neva remains of interest to community members, visitors, and even investors. Oracle software co-founder Larry Ellison’s investment firm recently offered to purchase the property for $38 million, according to Pioneer Funding Group Portfolio Manager Adam Stein-Sapir, who has been following the case. “You can feel good that he’s going to have the money. You don’t have to worry about him getting a mortgage or anything else,” he said. Ellison’s investment firm, PA Hotel Holdings, purchased the Epiphany Hotel in downtown Palo Alto in 2015. He’s also no stranger to expensive real estate, having earned the title of “the nation’s most avid trophy-home buyer” from the Wall Street Journal for his past investments in Lake Tahoe and Malibu. A plan to refinance the project with new money could emerge. It’s even possible that a deal emerges that would allow the original owners, Criswell-Radovan, retain some ownership. “What’s happening here are some (of the parties involved) have each filed a proposal to come out of bankruptcy, and they each have different methods for how they’re going to do that,” he said. Those plans are currently being reviewed in court, which is why the fate of the Cal Neva has yet to be determined. Stein-Sapir said that if a plan isn’t agreed upon the judge could order a sale. In that case, he said the property is sold free and clear of all liens and the money is divided among the creditors. He said that at this point, the judge needs to decide which plan, or plans, to move forward with, or if a sale is in order. But at this point there is no sale process in place. “Everybody wants this to go through quickly,” he said. Criswell-Radovan and their attorneys did not respond to requests for comment.